Have the rain gear handy for today. We will have on and off rain for today and warm temps. Steady rain moves in later tonight, especially for Southern and Eastern Ohio. Falling temps tomorrow with steady rain, especially for Southern and Eastern Ohio. As temps fall tomorrow the back edge of the rain will transition over to snow. They may be a narrow band of snow that could set up for a couple of hours in the early afternoon until another cold front pushes the wintry mix off to the east. 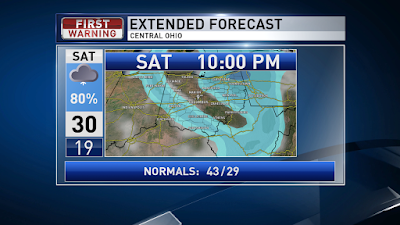 Once the system is on the move the switch from rain to snow will be brief for Eastern Ohio. 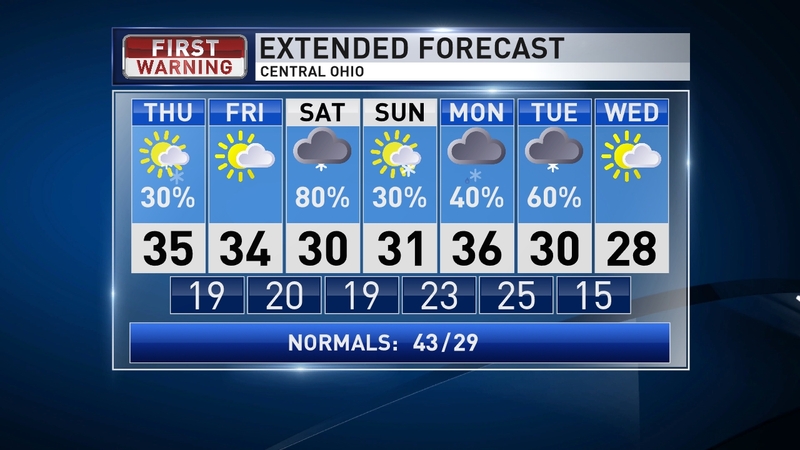 Mostly cloudy and cold on Sunday with some afternoon and evening light snow showers. The track of this system looks to leave an inch or two of snow for North and Western Ohio. Lower amounts to the south and east. 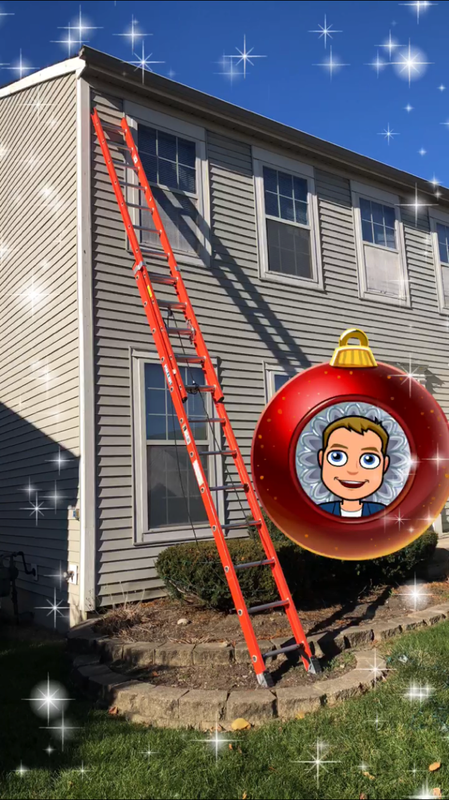 Based on the latest info, I would say Columbus has a 60% chance of a White Christmas (1" at daybreak) and a 80% chance of some snow being on the ground. 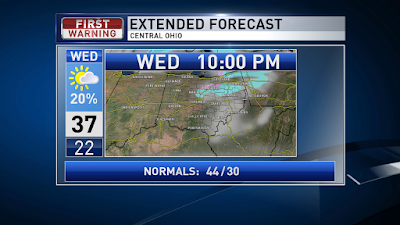 Better chance for Northwestern Ohio and less snow for Southeastern Ohio. 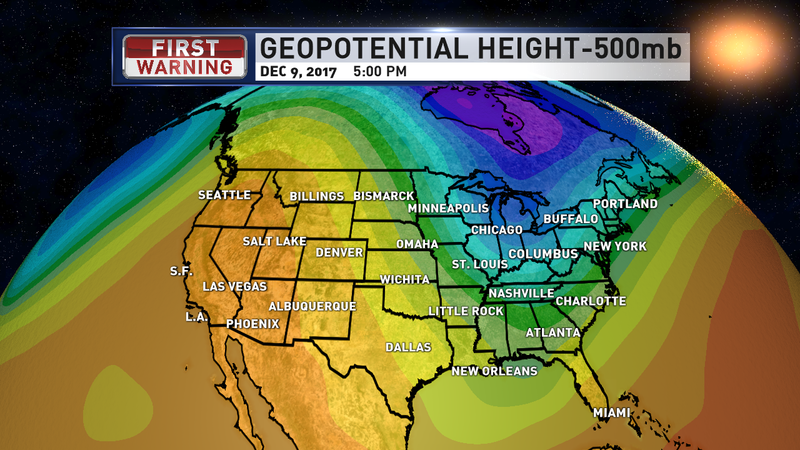 The map above is showing snow depth of 1" or more on Christmas morning. 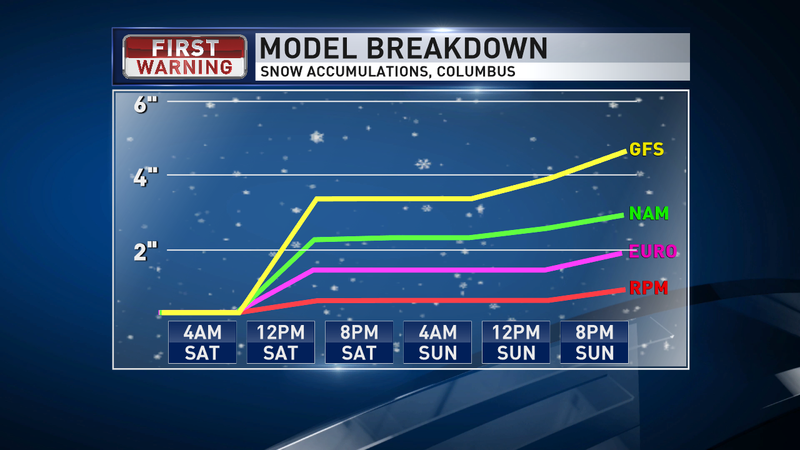 The RPM model does a good handle, historically, with snowfall totals. The GFS normally over-predicts precip. So take the above image with a grain of salt. Here's the model comparison for Columbus. The GFS tends to over-predict precip. This is the RPM forecast for snow totals by 5AM on Christmas. It does appear Northern Ohio will see better conditions for more snow Sat. PM and Sunday. Southern Ohio will likely see less. A few flurries through the day on Christmas and another round of light snow later Tuesday and much colder. Have a good one! I waited about a week. Well... really I had to get a lot of behind-the-scenes work done the past week. Building our augmented reality scenes take a LOT of time. Instead of building one graphic in a 2D screen, now it involves building that original 2D scene, then incorporating a new graphic element in a 3D environment and getting it all timed out properly is critical. Plus you have to get the camera shots set up perfect and for the 3D environment... It's BACK! 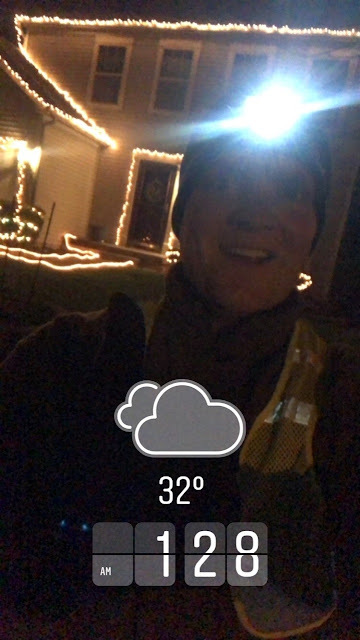 It's been great getting my daily run in with all the Christmas lights on. No matter what time I get out there! 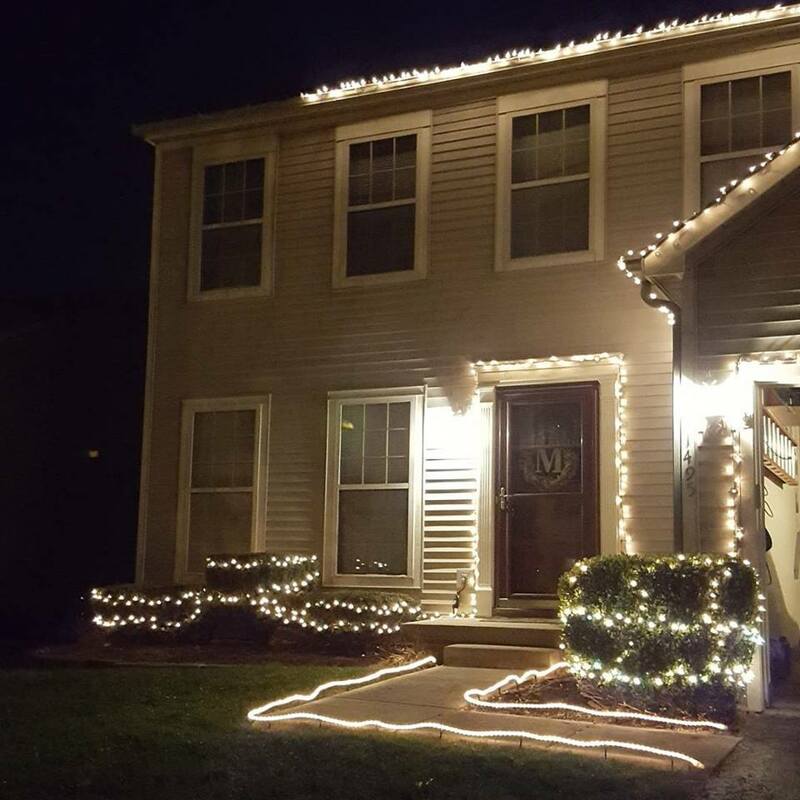 Props to all the overnight lights that have kept my Christmas cheer maxed out in the middle of the night. 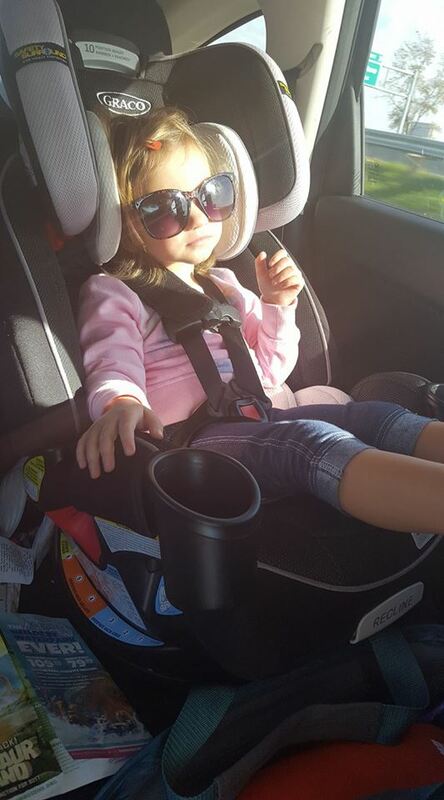 oday is our final sunny day before Christmas... so it's the best day to get those errands done! Chilly this morning with some frost then plenty of sun will warm us into the mid to upper 40s. Clouds moving in later today and rain showers start overnight. Spotty light rain on and off Friday and warm with highs in the mid 50s. Heavier rain moves in Friday night and early Saturday and temps start falling. 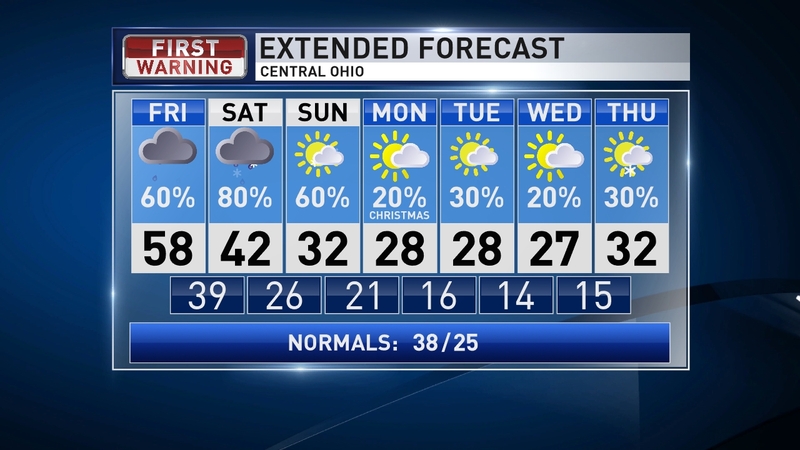 A second cold front will swing through later Saturday and if it arrives while we still have moisture around, it may drop our temps fast enough to change the rain to snow for pockets around Central Ohio. When a cold front moves through, normally we don't see much rain transition to accumulating snow because dry air works in, but the second front Saturday may increase our odds of snow with the second push of colder air. 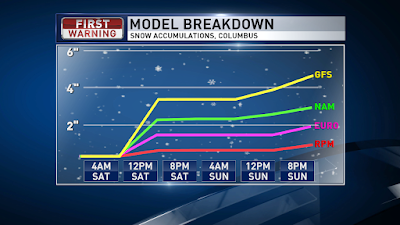 The models are still split with snow on Sunday. So a couple models show rain changing to snow Saturday, the other models that don't show that, bring in some snow on Sunday. 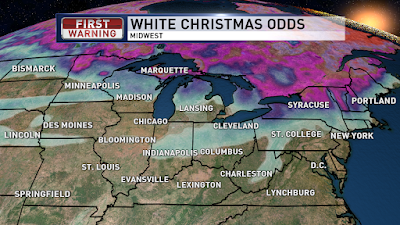 LOT of variables with moisture, timing, and track of systems playing a part in our odds of a White Christmas. Lot of variable with the next few days, but it will be dry today and with plenty of sun. Enjoy and have a good one! It has been nice to get a little taste of winter this week. Summer kept saying she wanted to outside and I figured she would want to come back inside within a few minutes, but we spent about 30 minutes outside until I finally decided we needed to go warm up. But I still try to have fun inside. 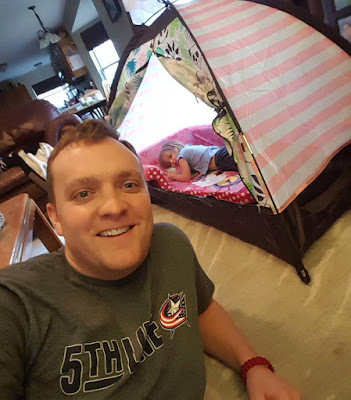 I set up the tent for some fun times in the living room. 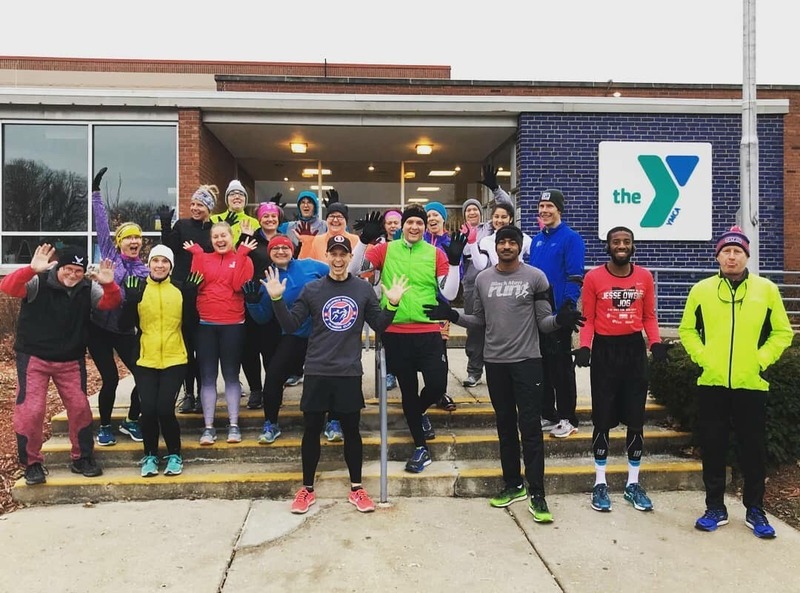 Saturday was our official start to the winter/spring training for Columbus Westside Running Club. We did 6 miles and I am the 9 minute pacer for the group. Super excited to take on the responsibility. 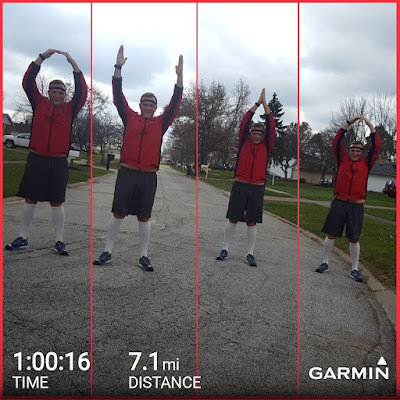 It was so warm this morning that I wore shorts for my morning run around the neighborhood before work. It felt great! So I have to apologize for lack of posts recently. We launched our new studio last week and it takes longer to build the graphics because we used to only use the green keywall for graphics. 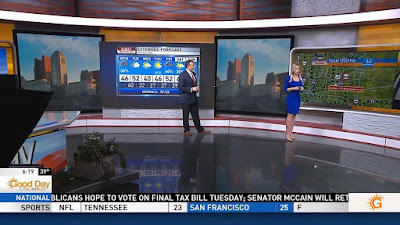 Now we have vertical monitors and most of the forecasts are at giant video monitors now. 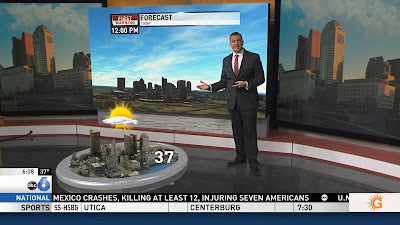 So I have been busy making new graphics for these new venues and it takes a lot more time producing each hit to tell the weather story. Not only just what to show and tell you about, but having graphics proper for that venue. 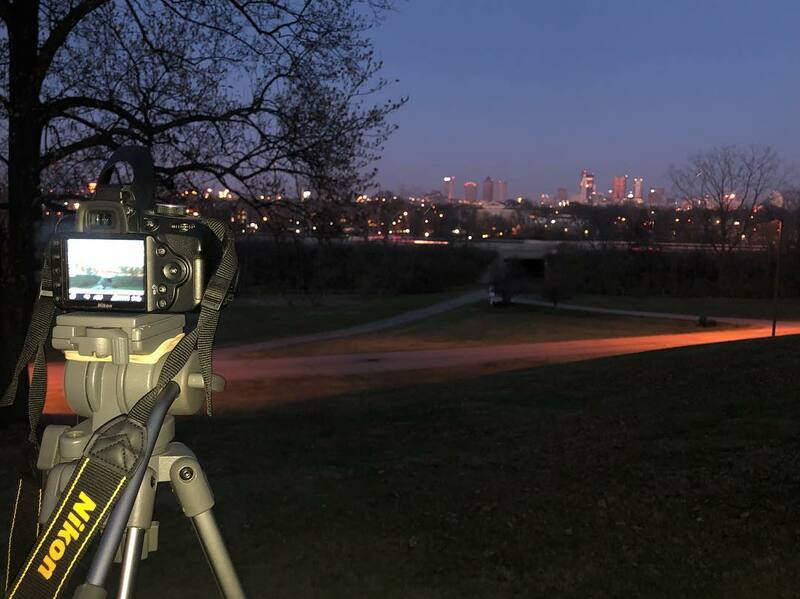 So extra workload for the first week meant that once we launched on Tuesday I have been focusing a lot more on on-air and didn't have 10 extra minutes for a post on here. Hope that changes soon for more regular posts. 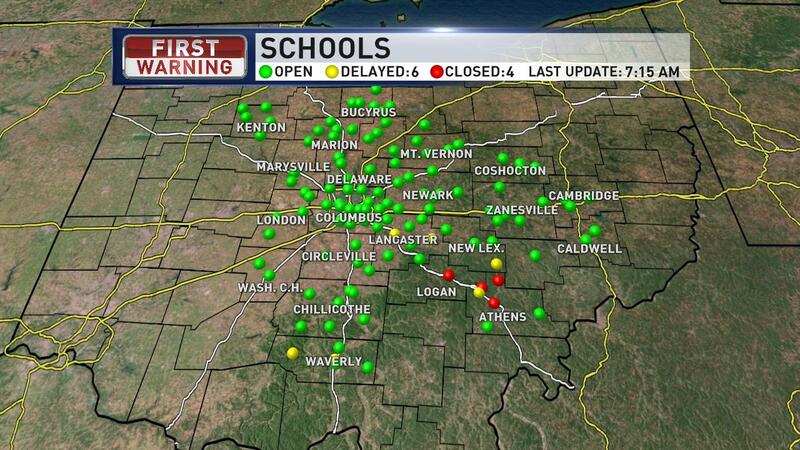 One graphic that I am particularly stoked about is our school closing map. I was able to use it a couple times last week. It has been GREAT to show the trend of where the worst conditions are on the roads. So far it has been working pretty flawlessly. I am excited for a REALLY busy morning to make sure everything is working with all the coding that went into the graphic. It is also nice knowing that this is something that you cannot find on other channels. Mild temps sticking around for the week ahead. Today we will stay cloudy with drizzle and patchy fog with highs in the mid 40s. Clouds stick around tonight and slowly clear out through the day Tuesday. Warm on Tuesday with highs in the lower 50s then a dry cold front comes through later in the day and cooling us off for the middle of the week. 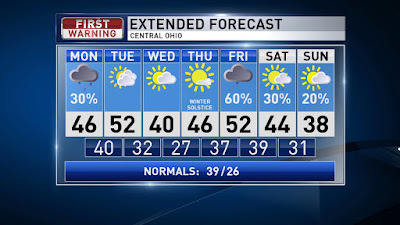 Highs in the lower 40s Wednesday and partly cloudy then more sun Thursday and warming into the mid 40s. 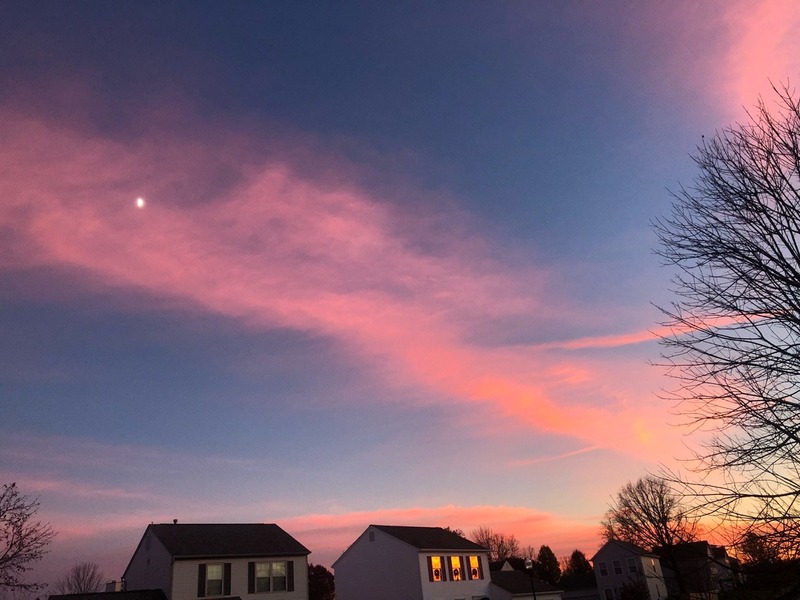 Clouds return Friday with rain, along with the 50s. Next weekend looks cool with spotty rain. Have a good one! Snow run, family time, more snow coming! 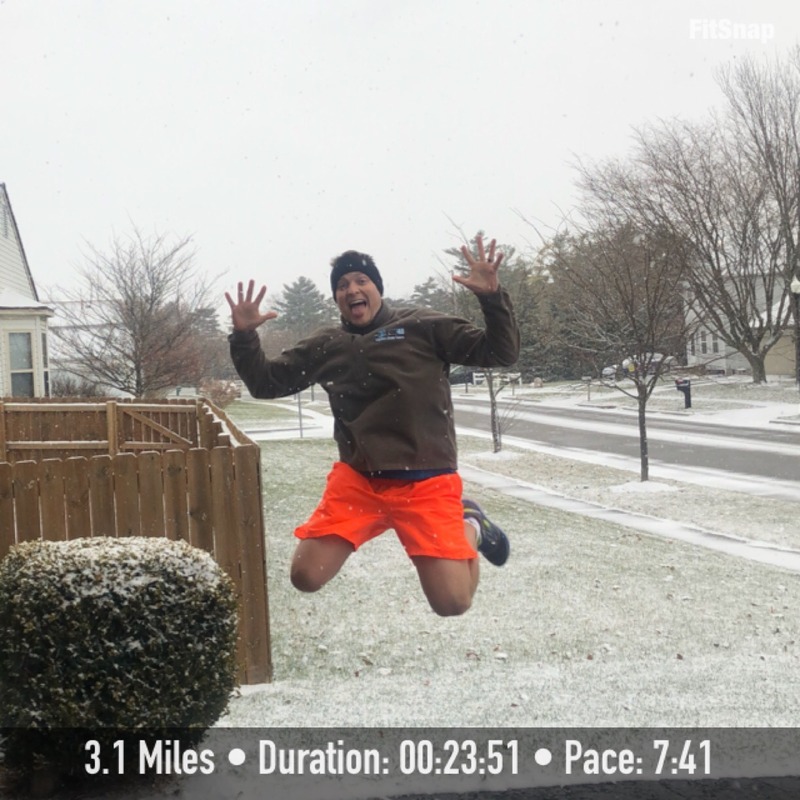 SNOW RUN! I LOVE running when there is snow falling. It's peaceful and an easy way to see who is a nut! 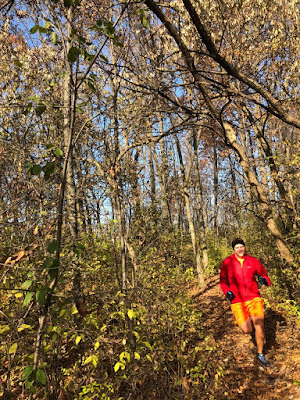 Temps were in the lower 30s with little to no wind, so I opted just for the shorts. Sunday morning with Columbus Westside Running Club I made sure to dress a little warmer since it was a longer run and temps were colder. We spent a lot of family time inside this weekend. 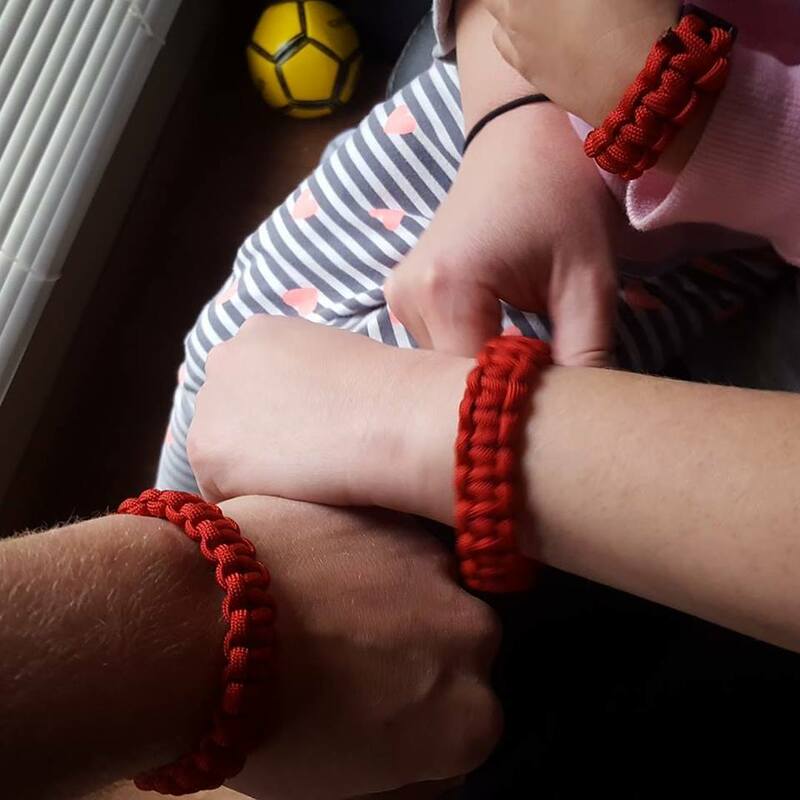 We also made matching parachord bracelets! My manager texted me and said it was distracting on TV, so I took it off while working. So we have a few rounds of snow on the way in the next 36 hours. A weak disturbance for Northern Ohio will be here later this afternoon and evening. Another round of light snow for the rest of Central Ohio tonight. Tomorrow the winds will switch to the northwest and that will bring in some lake effect snow. Each band will generally bring less than 1" of snow. The lake effect snow in the afternoon tomorrow could drop some heavier bands in isolated spots. We may get our first winter school delays/closings this week. I'm excited to start using this new graphic I built to save you time. I wish we had something like this when I was a kid. So your overall forecast... Round after round of slight snow is on the way this week, so really feeling like winter now! Today we will warm into the mid-upper 30s with mostly cloudy skies and a few flurries possible. Winds pick up tonight with scattered overnight snow showers. 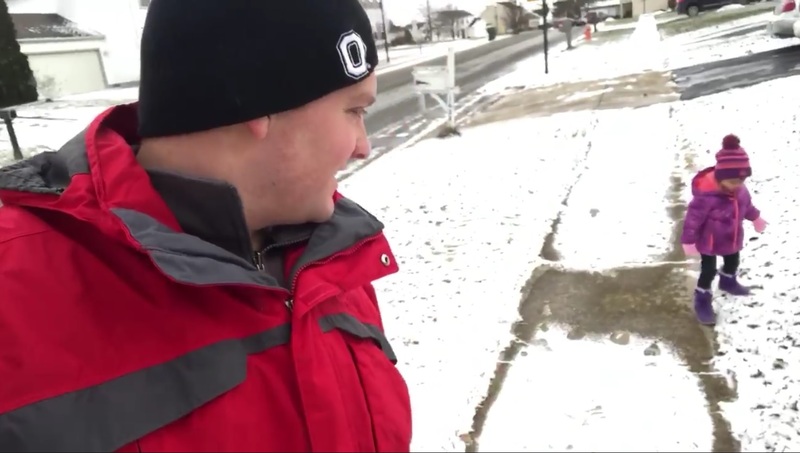 Scattered snow showers Tuesday, mainly early. Falling temps Tuesday with winds staying brisk. More spotty snow showers on and off later Wednesday, Thursday, & Friday. Each round will be light with accumulations generally less than 1" with each round. A few pockets may see more, with heavier bursts of snow. 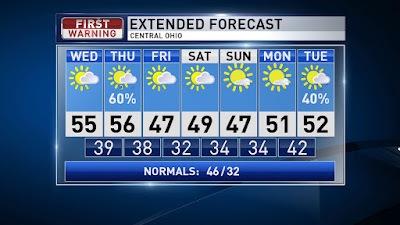 Warming next weekend into the 40s! Have a good one! 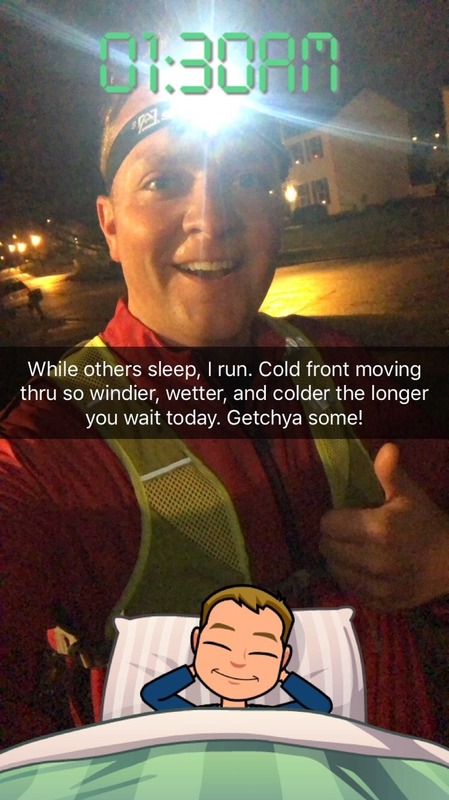 Late night runs, snow coming! 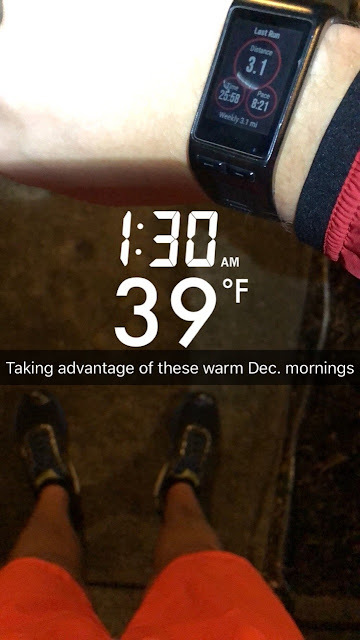 When you know it is going to be colder later in the day, you get your run in before work in the early morning hours. 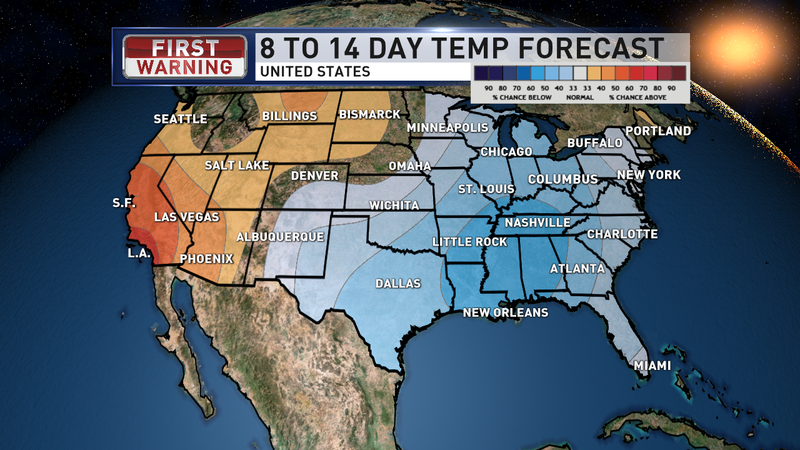 We have a big dip in the polar jet stream and causing our cool weather for the days and even weeks ahead. It is looking more and more likely that this pattern will set up for a lot of the winter. Get ready for lots of clipper systems bringing rounds of light snow over and over. I cooked this graphic up yesterday showing the winds and the California wildfires. The smoke was even view-able from our weather satellites and especially NASA's Terra satellite. 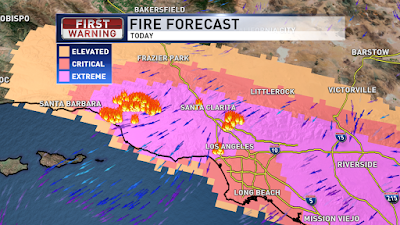 The fire forecast today has a LOT of SoCal under the "extreme" criteria for wildfires today. Not good. Very strong winds and very low humidity are not a good combination fighting the fires. 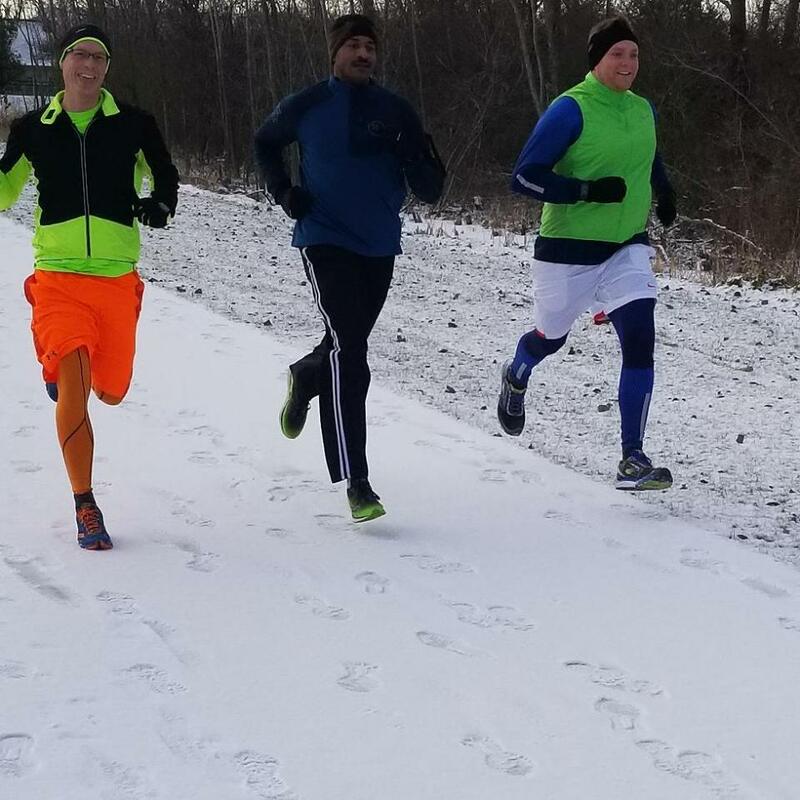 If you thought yesterday was cold, brace yourself! 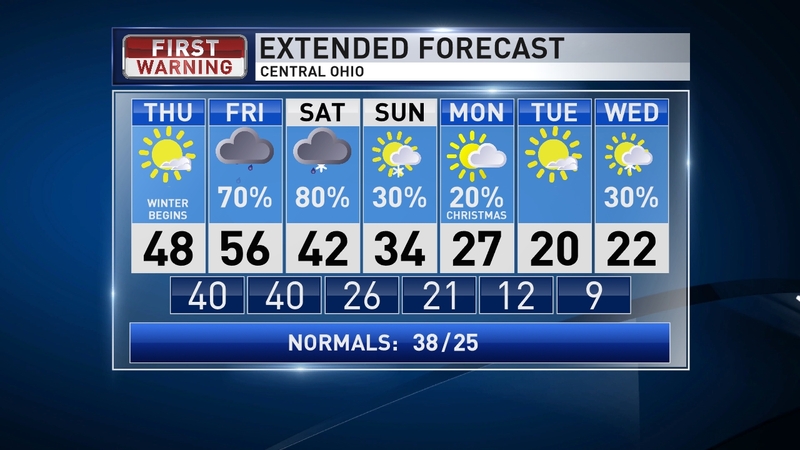 We warmed into the 40s yesterday afternoon, but the rest of the extended forecast has highs in the 30s and 20s! A weak disturbance will kick through for the first half of today bringing a few flurries and spotty light snow with no accumulation expected. More sun Friday before more clouds start rolling back in later in the day. Snow showers for midday and the afternoon on Saturday. The main track of this system is looking to go by our north, so our accumulations will be light, with up to 1" possible, and a few spots may see slightly more, mainly north. 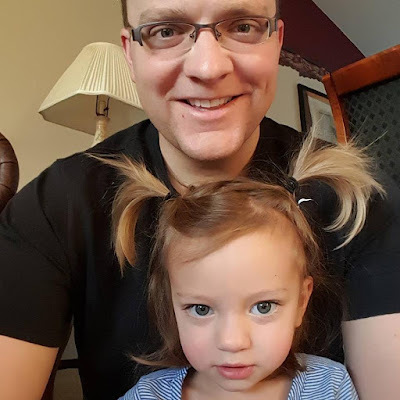 A few flurries possible Sunday and a high of only 30! Another winter system kicks in later Monday into Tuesday. 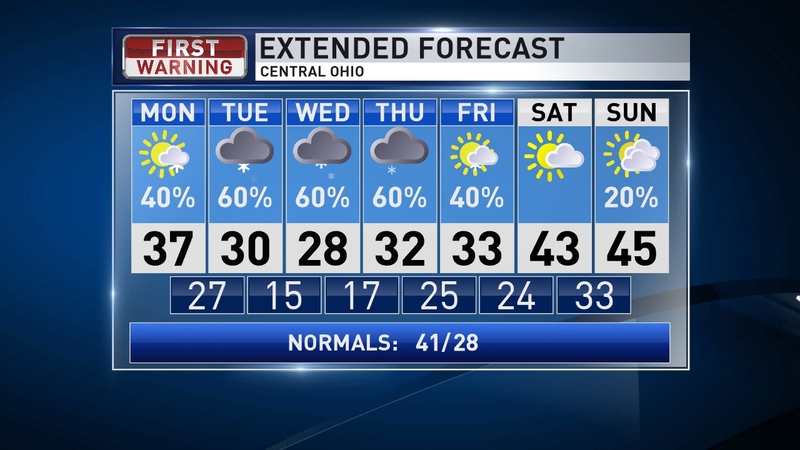 Monday we will be warm enough that the leading edge may start as a brief wintry mix then transition over to snow showers late Monday and Tuesday. Accumulations look light for Tuesday, as well, with this system, but the final track will help determine snow total. Have a good one! Here comes our first taste of winter!! Thursday was Dawn's birthday! Happy birthday love! 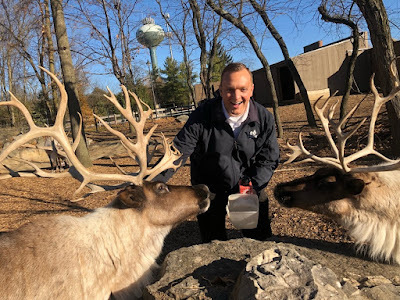 We went and visited Santa last week for our holiday cards. 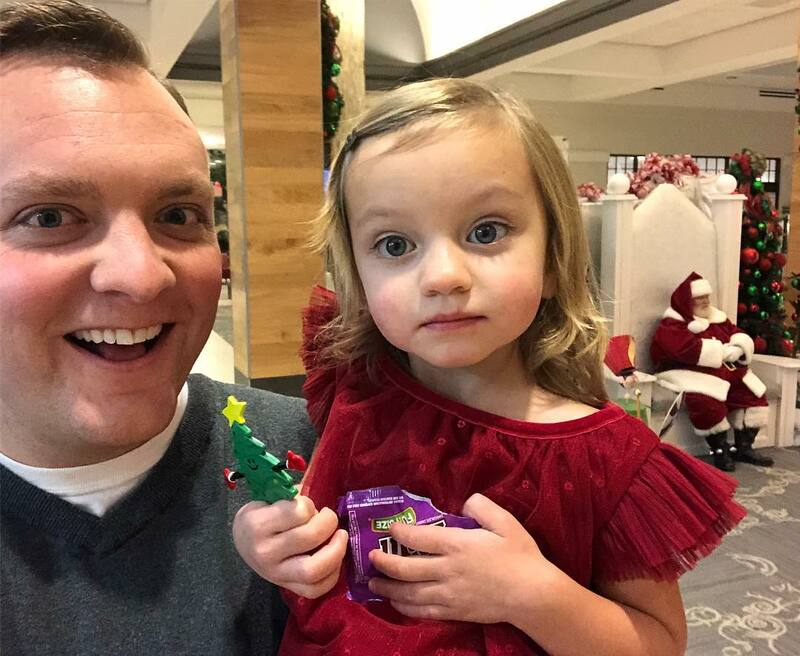 Santa is a VERY loyal viewer of our morning show. Smart man. I also got to feed his reindeer at the Columbus Zoo last week for work! 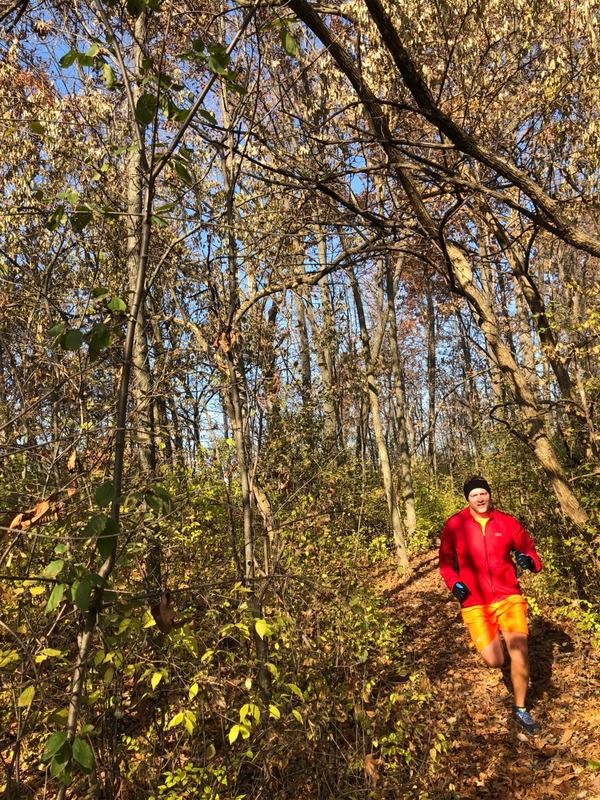 Last week was so nice outside that it was hard to find me with pants on... Don't worry I was wearing shorts. But it was gorgeous and it looks like we have one final warm day, today. 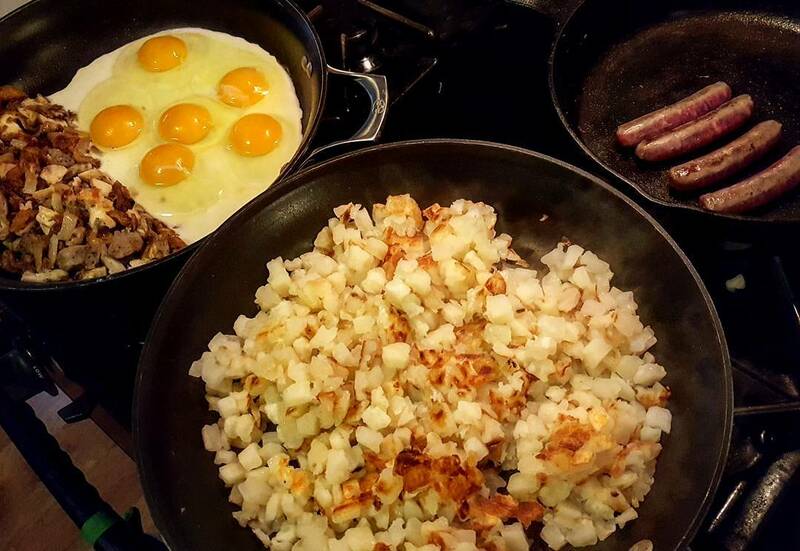 Made a huge breakfast on Saturday morning. Potatoes, sausage, and a bloomin onion omelet. Over the weekend I spent as much time outside as a could. 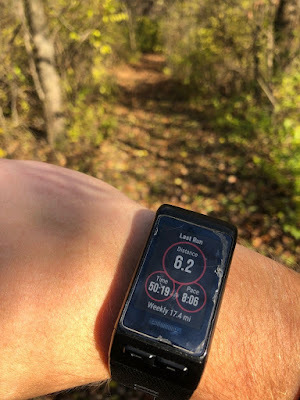 I went for a run on the local trails. Not a terrible time either. 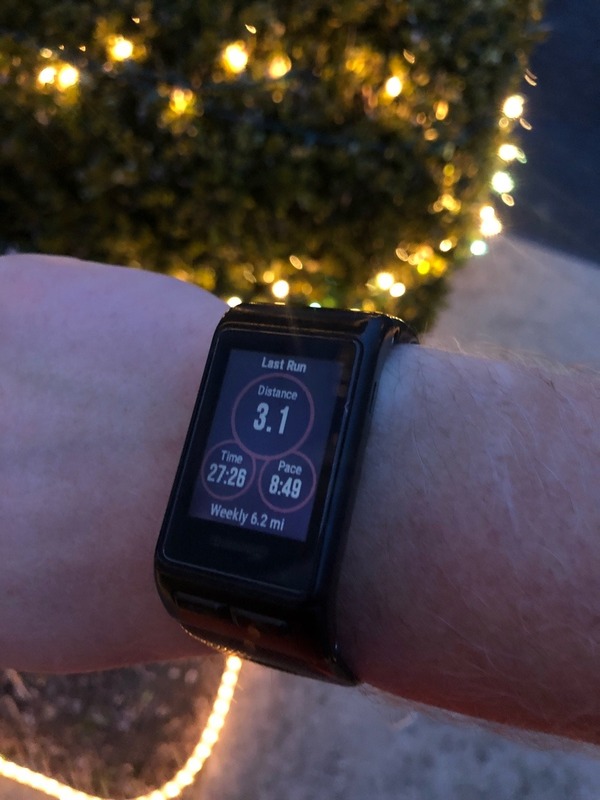 I would love to get a sub 20 5k and a sub 45 10k. We had the supermoon last night. Luckily it was perfectly timed during halftime of the Browns game. This is as good of a shot as I could get with the stock lens on my camera. 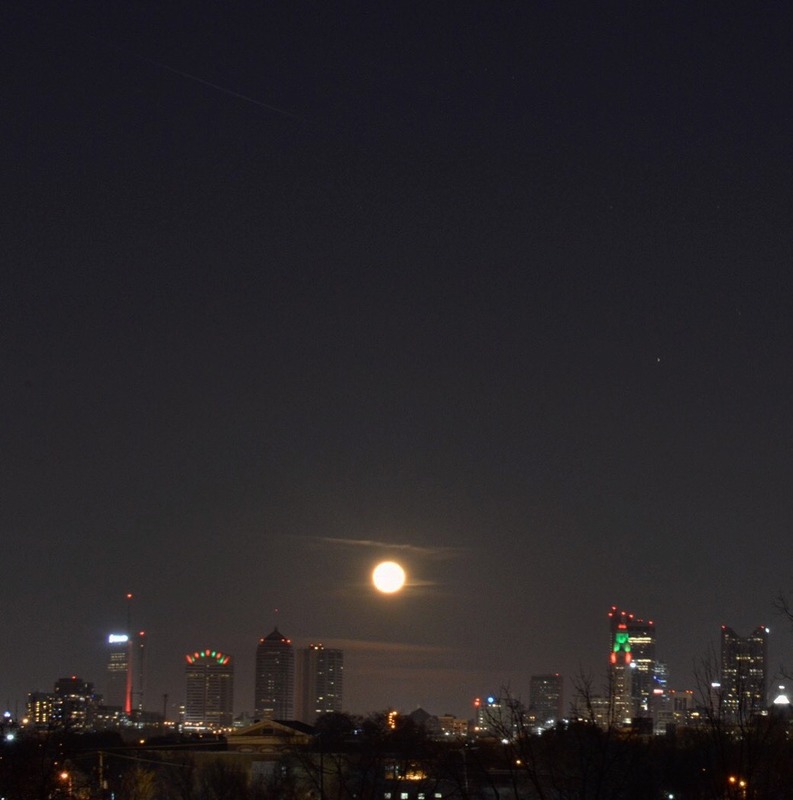 Took this from the Hilltop of Downtown Columbus. 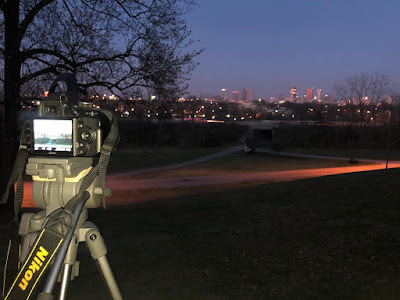 I would love to learn how to shoot night shots better, but it was hard to do that AND get the city lit up too. 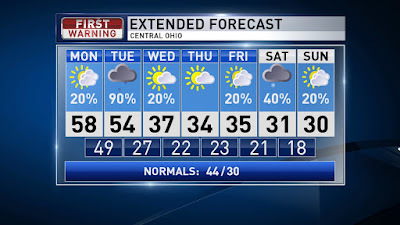 Enjoy the warm start to the week because it will not be lasting long! Today we will see increasing clouds and a brisk breeze pushing our temps to near 60 for the high. Rain moves in this evening and our steadiest rain will likely be early Tuesday morning. Rain starts moving out by midday Tuesday then cooler air rushes in with falling afternoon temps. Highs will barely get above freezing later this week. A few flurries possible Wednesday then watching another system by next Friday & Saturday. The newest forecast models are wanting to dive the storm farther south, but track of winter storms can be tricky and will fluctuate some over the days to come, so stay tuned. Have a good one! 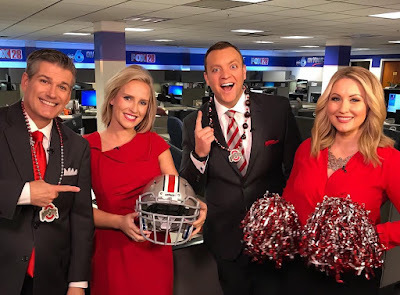 We had a lot of fun Friday getting ready for THE game! Summer enjoyed some travels and got to see both sets of grandparents this weekend. 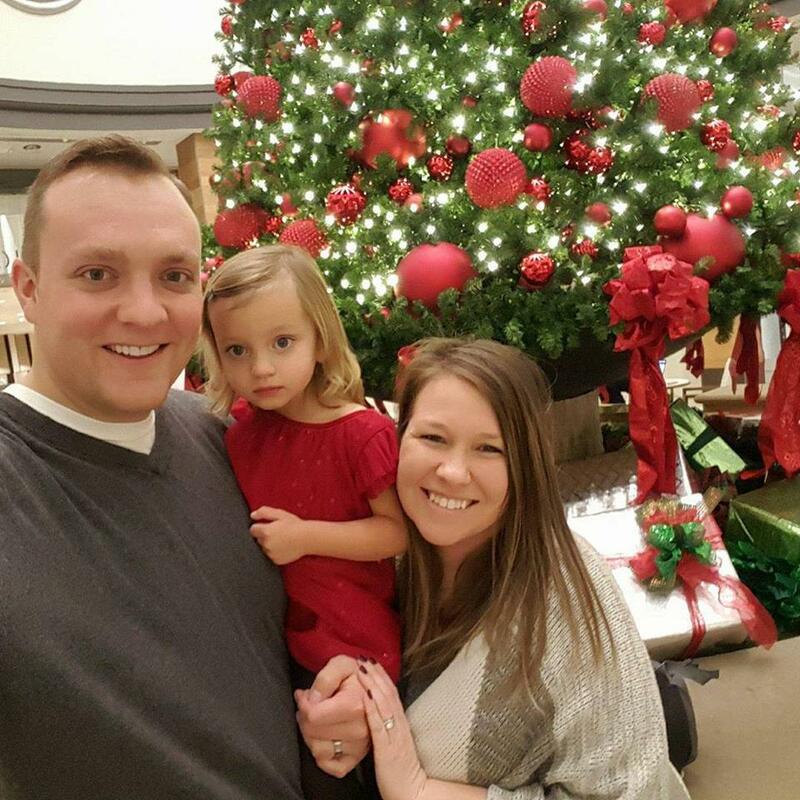 I went up to Cleveland to spend the weekend with Dawn's family. I got up with Summer both mornings and we had fun hanging out while the rest of the family slept in. Like what I did with her hair? 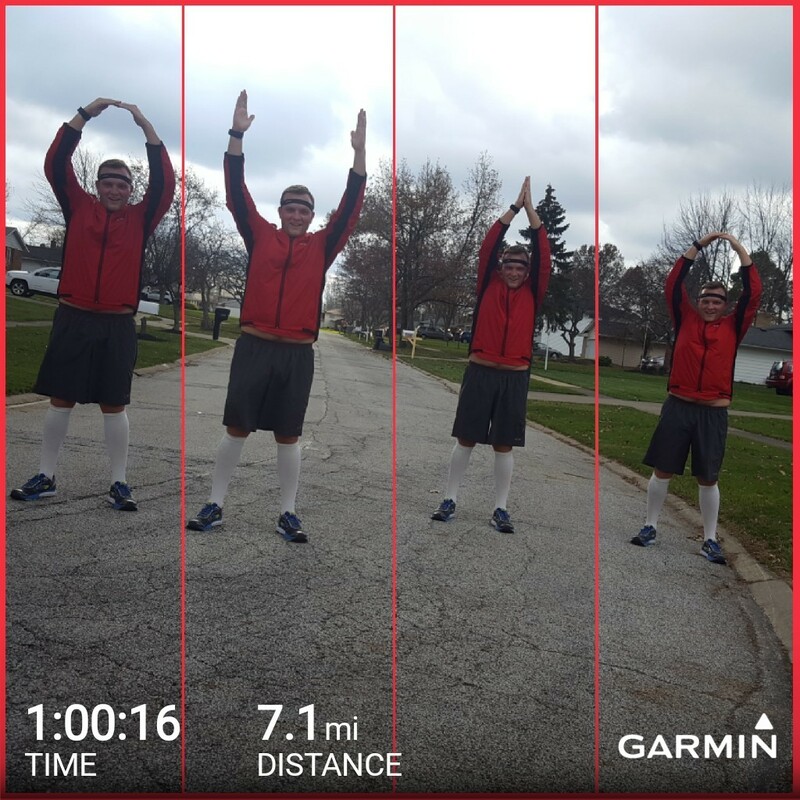 I went for a run before the game and did a lucky seven miles and thankfully the Buckeyes were able to get a win against the team up north. 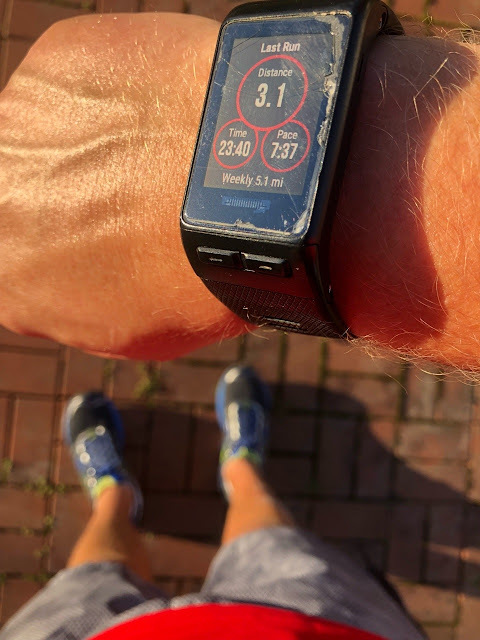 I am in the middle of the Runner's World Run Streak. 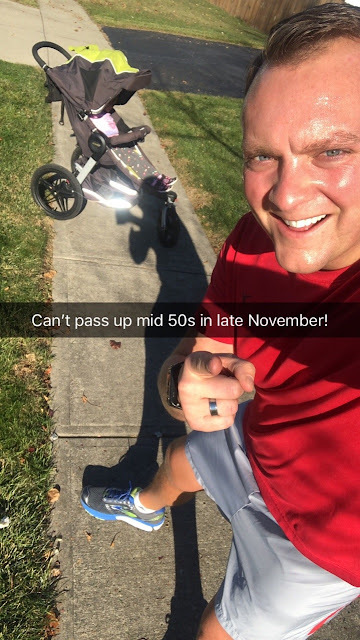 And it's a good thing I have been staying active. Monday morning I tried breaking into the new studio... But... they were still locked. We are doing run-throughs this week to work out any unforeseen kinks. The new set is AMAZING and cutting-edge. How about this sunset from Monday! No filter used! 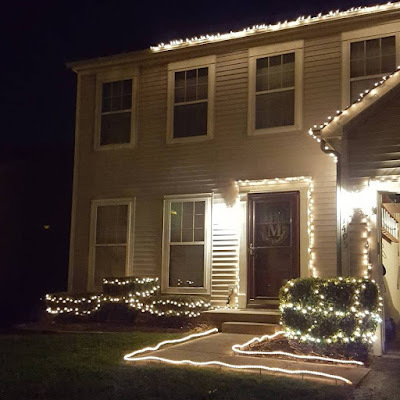 I hung up the lights yesterday. It went very smooth... almost too smooth. Once Summer woke up, we went to see Santa! She was VERY shy. We only managed to get the smallest smile when she was sitting with Santa. When we got home... ONE OF THE STRANDS WAS OUT! DANG IT!!! I will have to climb back up there and try fixing it today. Temperatures today will be about eight degrees cooler than yesterday, but still remaining nearly ten degrees above normal. 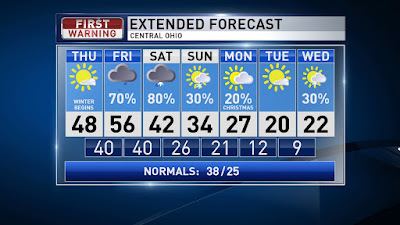 So... enjoy our mild temperatures before colder air arrives. Passing early clouds for your Wednesday then some midday sun followed by more clouds this evening and tonight. Temps will top out in the mid 50s today and tomorrow, however rain returns tomorrow. Increasing clouds Thursday with some scattered afternoon rain showers. 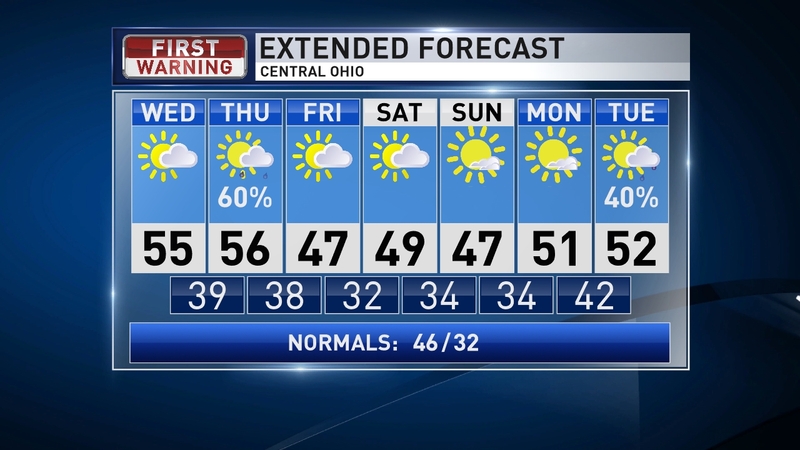 Temps cool off more for Friday and the weekend, highs in the upper 40s, with a mix of sun and clouds. 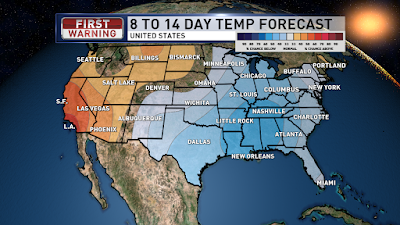 A much colder push of air is looking more likely for the second half of next week. Have a good one!